Jared Unzipped: I Hate Onions. I like food. My palate is highly diverse. Whether it be from the ocean or the sky, crawls on four legs or has an exoskeleton, I'm a fan of eating pretty much anything. Except onions... I hate onions. Why all the love for onions? I have two chief complaints with them. Onions are all filler. They take up space in a recipe or on a dish when other, more flavorful ingredients could be used. Onions are cheap and help to pad a dish out, making it look bigger and better than what it really is. You see, Onions are the Jar Jar Binks of the culinary world -- pointless, without any substance and ultimately a waste of your time. It's not the taste of onions that bothers me; it's their texture. I can't stand how waxy and hard they are when you crunch down on them. 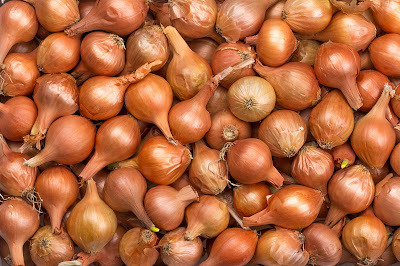 Even worse is when onions have been partially cooked and develop a wet, slimy coating. The sensation of an onion in my mouth is enough to make me barf. It's the same reasoning as to why I won't eat cooked peas or green peppers -- they feel excruciatingly gross in my mouth. The thought of putting an onion into my gullet hole is enough to turn me away from a restaurant. So often I encounter dishes at restaurants that have onions included in them, wherein I would never expect them to be. I believe this is largely a reflection of agriculture in the South -- onions grow really well here. To this day, onion farming in the Southern region is still a big business. Which came first, though? The onion farming, or the love for eating onions? To that question, I have no clue. Either way, I don't care.